Thank you so much for the opportunity to introduce ourselves to you. 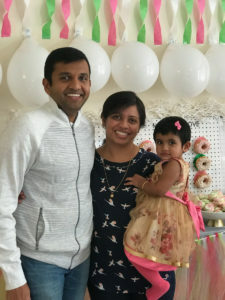 We are currently a loving family of 3, Phani (husband), Sandeepa (wife) and Shree (daughter). We cannot begin to imagine the journey you are going through - all we can do is promise you that we will love your baby unconditionally and raise him/her to be a moral, independent, responsible and empathetic person. Married for 11 years now, we both come from large close-knit families who are very supportive. Together we enjoy travelling, the arts, board games, movies, cooking and time with friends and family. We are looking forward to adding another baby to make our family complete and hope that we can provide the home you are seeking for your child. Our marriage is built on love, trust, mutual respect and appreciation for each other. We love and encourage one another to pursue our dreams and are always there for each other through life’s journey. Whether it is traveling to visit new places or playing board games at home, the fun never ends as long as we are with each other and with friends/family. During long weekends or while we are on vacation, we like to travel to national parks to hike, camp and just be one with nature. When we are at home, we like to cook together and watch movies. Our favorite dish is making frittatas for Sunday brunch and we love watching animation movies, especially at drive-in theaters. We also appreciate music, arts, theater, and sometimes like to sing too! We have been season ticket holders to our community live theatre and the summer Illinois Shakespeare festival. We also get serious and volunteer together in our community on a regular basis. A steadfast and happy part of our lives is our very close-knit, large family. Both of us talk to our siblings and parents regularly. Our core foundation is our family with cousins, aunts and uncles, 3 siblings, 6 nieces and 1 nephew. Our families have supported us through all our emotional ups and downs as we tried to become parents. They are very excited about us growing our family through this process. We both have happy childhood memories of spending several weeks each summer at our grandparents’ homes. One of Phani’s favorite childhood memories is of his grandmother narrating wonderful, imaginative stories day after day, throughout the summer to all her grandkids. Sandeepa’s parents would take her and her brother to visit their cousins on most weekends. Her favorite memory is singing karaoke as a family on their long drives to visit her relatives. In addition to our family, our friends complete our support system. We have a very close circle of friends that we consider our extended family. We enjoy hosting our friends and their families for an evening playing Pictionary or charades, a fun Sunday brunch or volunteering at the local soup kitchen for the homeless. Our friends cannot wait to become our childrens’ God parents. We have been trying to become parents for 6 years. We’ve always dreamed of a family with 2 munchkins Ð whether they come to us biologically or via adoption. After several struggles with infertility, we were blessed with our daughter, Shree. She is a happy, silly and curious 2 year old girl. Her favorite soft toy is a zebra, she likes to feed the zebra and rocks it to sleep! She also loves puzzles, butterflies and going on playdates with our friends’ kids. When we travel, we like to travel as a family. Shree has already been to California, Florida and Bahamas, but her favorite is playing on the sand at the beach. We have been talking about adoption by asking her if she wants a brother/sister and she always says “yes”. Although we know that she does not understand all the emotions involved in an adoption process, we know that she is eagerly looking forward to playing with a new brother/sister. Our home is located in a small city in Central Illinois in a cul-de-sac, away from traffic. Our neighborhood and town provide all the amenities offered by a big city, along with the comfort and safety of a small community. One reason we chose this house 11 years ago is that it has plenty of room for a growing family, and we hope to make many more memories with our children in this home. Our street has several kids of varying ages, from neighboring families, that come out and play on their bikes or draw on the sidewalks with chalk. We have a park close by with swings and slides, where our daughter and other kids go on a regular basis for more organized play time. We enjoy our home as a center of action as well as a peaceful retreat. We’ve had loud and noisy parties with our friends and their kids at our home, and have also spent many quiet weekends chilling on the sofa catching up on a movie. We both have Masters Degrees and work for a large insurance company in Central Illinois. Phani’s work focuses on risk management, while Sandeepa works in data analytics and statistical modeling. Lucky for us, our commute to work is only 5 minutes affording a healthy work-life balance, and time to pursue our passions and quality time with family. Sandeepa has been the source for unconditional love in my life. She is an extremely patient, caring and independent person. I love her positive/healthy disposition towards life and the many adventures it has to offer. Arts, music and fun fill her life. As an advocate for DIY, her art work provides a colorful décor for our home. Sandeepa has a sweet laugh and a sweet tooth. She is great at baking and making healthy nutritious food, especially her smoothies. 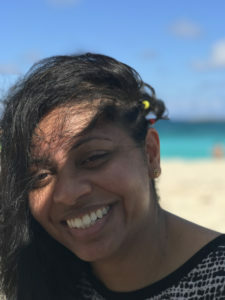 Sandeepa is the anchor/glue of our household, taking care of mundane things like ensuring bills are paid to planning relaxing vacations. She is spiritual and is a person of faith. I haven’t seen another person who’s as content with life as her, with tremendous appreciation for where and who she is in life. People, especially kids love talking to her. Our daughter dotes on her, well they dote on each other. Her time with her mother, be it bath time, play time or nap time, are special to both. Mommy has to be around. 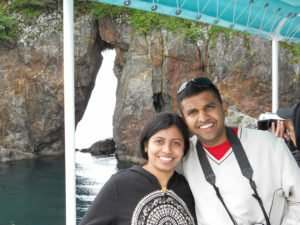 Sandeepa is a fabulous spouse, mother and a best friend. Your child will have a wonderful mother in Sandeepa who will love, care and nurture him/her. Phani is a fun-loving, adventurous person with an appetite to try new kinds of food. He enjoys watching sports, but if he could, he would spend most of his time outdoors with friends and loved ones. Phani’s values are grounded in equity, justice and integrity. He is very passionate about giving back to the community and founded a not-for-profit organization called “For a Better Tomorrow”. This group gets together to organize fund raising activities that bring together families from all backgrounds to build a better future for everybody. One of these activities is an annual Kite Festival in our town, where hundreds of families get together to fly kites! 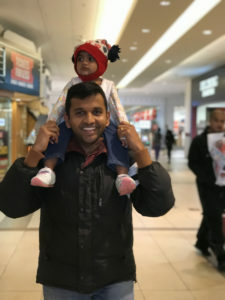 Phani enjoys his time with children whether it is our daughter, nieces, nephew or our friends’ kids, they all adore him because he’s always finding new ways to make them laugh. Phani and Shree share a special bond. I love that Phani is able to be her teacher while being her best friend at the same time. He is able to teach our toddler important things without making them feel like chores, like drinking her milk without spilling, or the right way to hold a pencil to color. The best thing that I like about him is his sense of humor and that he’s always ready to lend a helping hand. Your child will have the best dad in Phani who will love him/her unconditionally and will try his best to raise them to be a wonderful person. We believe that showing love is just as important as telling our child that we love him/her. Lots of hugs and kisses are a part of our daily lives but we never stop there - we have dance routines, tickle monster sessions, high-fives, fist bumps and take turns singing! We both grew up in families that believe in providing opportunities for education, arts and sports; and will encourage our children to explore and learn as well. We believe that a college education will provide a strong foundation in a child’s life. We have been saving towards our children’s college fund and have already set up a 529 account that will grow as our babies grow into young adults. We hope to impart our values to our kids, as they discover their own: empathy, social justice, integrity and the importance of friends, family, and community. We subscribe to the philosophy that empathy and honesty are very important in all relationships. It is our hope that our children know where they came from and have an outlet for any questions that may arise throughout their lives. We plan on keeping open lines of communication for sharing photos or letters with you, so that you can rest knowing that your choice to trust us is a good one. You will always be an important part of our family story. This is an important decision for you and we appreciate you giving us an opportunity to grow our family. We will welcome and love your child as our own, to raise him/her to be and become the person they are meant to be. Thank you for taking the time to get to know us. If you have any questions or would like to talk on the phone, please call Cindy at A Loving Alternative at 800.556.5635. Counting kites at our local Kite Fest! Phani loves being a dad! Had a thrilling parasailing experience! This was Shree’s first face painting and county Fair experience! Enjoyed a horse ride through the Utah desert! Phani’s thrilled about the zipline ride! Excited while getting ready for a zipline experience!